It used to be a tradition for the Club Captain to organise a trip away over Easter. I am not sure when this tradition ceased, but in my early days as a Club member I did take part in what was probably the last such Easter away. This long weekend of cycling was organised by the then Club Captain,Peter Trimming. He took us down to Winchester, which was our base, and we had some interesting rides about this very scenic part of Hampshire. The weekend culminated with the longest ride which took us in and around parts of the New Forest. Easter being early in the year, the weather can be a bit of a gamble. I do remember riding back to our B&B on one of the days, in torrential rain. But that was just on part of one ride on one day. The rest of the time my memory tells me that we had good days with plenty of sunshine. I of course was not the only current member of Anerley B.C who took part in this Bank Holiday cycling treat. Jeremy was there, as were John Dadson and Sian. John and Meike were holidaying in the New Forest and we met up with them on our visit there. There were 2 or 3 others who are no longer in our club. With Easter only a few weeks away, you might be interested to read a bit about the very first Anerley, Easter Tour, as remembered by someone who was there, all those years ago in 1889! 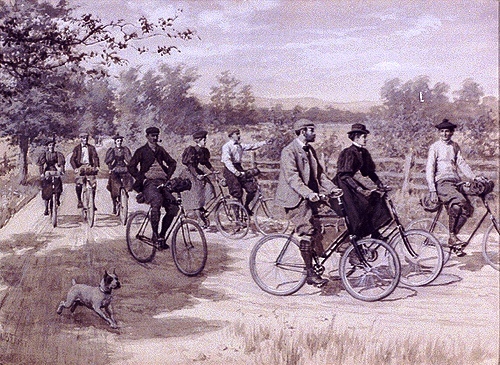 The First Anerley B.C Easter Tour, as remembered by G.H.Smith. The first Easter A.B.C. tour that the writer can distinctly recall was, I think, in 1889, or there­abouts, when the Club went up on the Great North Road. A member of the Club, with a vivid imagination, S. F. Edge by name, had been up in those regions and brought back reports of a wonderful land of promise, an ideal country where roads were always smooth, and level, where you simply had to sit softly on your saddle and glide along all day from one famous roadside hotel to another, where food was always ready on groaning tables, and the delight of the proprietors at being visited by cyclists was such that they made merely nominal charges for the plethora of good things they pressed upon their delighted guests. If we had the slightest suspicion that this picture might be a little overdrawn, it was aroused when the author of it announced to our surprise that he had decided not to be one of the party. It seemed a little queer that having once tasted these delights he did not take the opportunity to have another bite. However, we went, we saw, and we got the knock. It turned out to one of those Easters when it blows hard all the time and rains most of it, further; it was bitterly cold. The whole party had an awful gruelling, go in what direction they might, they could not escape the fierce winds that blow across the fens, and this went on for four days. The wet, too, was icy and vicious——and as it was not ‘the thing’ then to use mudguards, so the welcome at the inns was not always of that enthusiastic nature we had been led to expect. The only lucky man was H. J. Ruston, who had his ‘‘Facile’’ blown over and smashed beyond local repair. He smiled for the first time, and went home by train; lucky dog! Graham is another fan of cycling in the New Forest, having ridden an audax type event there several times in the past. went there twice last year,did you get my email about Thursday cannot lead im working.